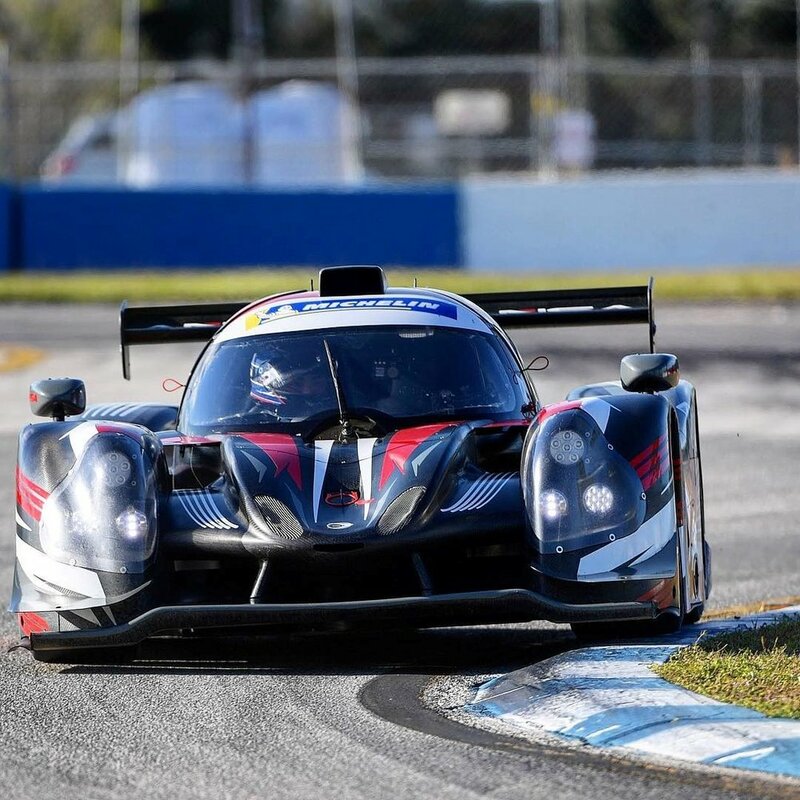 San Diego, CA (November 13, 2018) – Dakota Dickerson got a taste of what it is like to compete in a 4-hour endurance race this weekend in the Michelin IMSA SportsCar Encore event at Sebring Raceway. Coming over from open-wheel racing, the F4 US Champion was treated to a whole new type of race weekend, thanks to ANSA Motorsports, Ligier and Onroak Automotive. Three different classes of cars were grouped together for the Encore weekend, namely the GT4, TCR, and the IMSA Prototype LMP3. ANSA Motorsports fielded three LMP3 cars, with Dickerson sharing the No.2 Ligier machine with co-drivers, Jon Brownson and Neil Alberico. All cars were outfitted with the new Michelin Pilot tires offering good grip on the bumpy Sebring circuit. Friday and Saturday’s practice sessions were all about getting comfortable with the car, learning the track, practicing pit stops, and looking at data and video to see what improvements were needed. The No. 2 car team recorded a top-five in the second practice with Dickerson logging a top 2 time during his stint in the third practice. Dickerson (right) with co-driver Neil Alberico (left) and team owner Alain Nadal (center). Unable to make qualifying, the Brownson/Dickerson/Alberico trio started at the back of the LMP3 grid, with Jon Brownson taking the green flag at noon on Sunday under sunny skies. The 4-hour race was filled with excitement and incidents, bringing out a few full-course cautions and drive-thru penalties for some drivers. On Lap 26, 55 minutes into the race, Brownson who had moved up to 9th place, came into the pits for a driver change. Dickerson jumped into the car and was able to unlap the field and was pacing the leaders before he had to pull off next to the tire wall near Turn 9 due to a mechanical issue. Dakota Dickerson’s race fans can follow him on his website dakotadickersonracing.com, Instagram (@dickersonracing), Facebook (Dakota Dickerson Racing) and on Twitter (@DickersonRacing). Dakota Dickerson is a third-generation racer from San Diego, CA. The 21-year old has been racing since he was 6 years old and is currently the 2018 champion in the F4 US Championship powered by Honda. In his first two years of racing cars he won a Driver Development scholarship from Bryan Herta Autosport (2-time Indy 500 winning team), a Karts to Cars scholarship from Skip Barber Racing School, was chosen to be one of two drivers to represent the United States overseas via the Team USA Scholarship and was the 2016 USF2000 Mazda Scholarship Driver. With this success, he hopes to continue on to the Verizon INDYCAR Series. The International Motor Sports Association, LLC (IMSA) was originally founded in 1969 and owns a long and rich history in sports car racing. Today, IMSA is the sanctioning body of the IMSA WeatherTech SportsCar Championship, the premier sports car racing series in North America. IMSA also sanctions the IMSA Michelin Pilot Challenge and the IMSA Prototype Challenge as well as four one-make series: Porsche GT3 Cup Challenge USA by Yokohama; Porsche GT3 Cup Challenge Canada by Yokohama; Ferrari Challenge North America; and Lamborghini Super Trofeo North America. IMSA – a company within the NASCAR family – is the exclusive strategic partner in North America with the Automobile Club de l'Ouest (ACO) which operates the 24 Hours of Le Mans as a part of the FIA World Endurance Championship. The partnership enables selected IMSA WeatherTech SportsCar Championship competitors to earn automatic entries into the prestigious 24 Hours of Le Mans. For more information, visit www.IMSA.com, www.twitter.com/IMSA or www.facebook.com/IMSA.